I can't get enough potatoes. Mashed, squashed, sliced thin and deep fried (yes, french fries.) They are just so good. I am always looking for a meal that goes well with potatoes, and the Miso Salmon I wrote about last year begs to be paired with this delicious comfort food. Wasabi Mashed Potatoes. 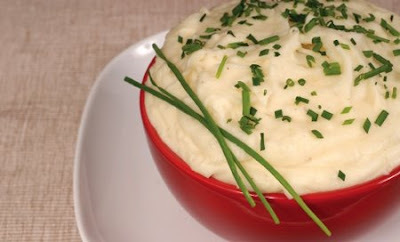 They have all the creamy goodness of normal mashed potatoes, but with a flavorful punch. Follow the steps for these classic spuds, and then stir in wasabi paste to desired flavor. (I used about 1 teaspoon for 6 medium russet potatoes.) Delicious topped with chives and a drizzle of the miso glaze from the fish.